Alexis Ames has a life full of promise…but not all promises can be kept.When Alexis Ames is attacked by creatures that can’t be real, she decides it’s time she learns who she really is, with or without the help of her mother, who guards their family’s secrets closely. After meeting the inhumanly attractive, multi-talented Tristan Knight, however, Alexis retreats behind her façade of normalcy…until she discovers he’s not exactly normal either. Then their secrets begin to unravel. Kristie Cook wrote her first story called Gnome Cave in elementary school. Urban fantasy writer and got her an A+. Her talent there got her into the Quill and Scroll Honor Society. She finished college with a Marketing degree. During her time in the big world she has accomplished many things and awards 1st and 2nd place in the Kansas Press Association for her stories. Summer 2010 Kristie blessed us with a fantastic book‘Promise’. It must be hard to write and have a family consisting of 3 teenage boys and two dogs, but has the surroundings of Florida on her side. If you would like more information about Kristie Cook and her fabulous work please check her website http://www.soulsaversseries.com I am lead to believe she will have a UK site up and running very shortly. Kristie writes her urban fantasy book from the heart or what seems to. Her choice of words and vocabulary in the story works well and nothing is repetitive. Her characters are pictured and described so well I have visions of how they will look, their facial expressions, build and dress sense. She captures the places well too and they are places I could only ever dream of in the financial burden of things and having a family myself. Her work I feel reaches out to teenagers as well as housewives and grandmothers! It is a book that you can relate to whether it be school, emotions, friends or love. I felt I got so engrossed with her first book I knew they weren't going to let me down and I downloaded them all there and then. I related to the characters and got sucked up into the story. 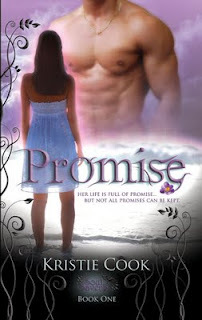 I felt the emotions they felt and at no point did I get lost during my read of Promise. This is a book I would give 5 out of 5 stars for. I wanted to go to bed to read, I found I was taking the kids out more so they could play and I could read. I am looking forward to reading more of Kristie Cooks novels. Thanks for reading.